Pete Owston worked for the US Forest Service for nearly 45 years, first as a summer student and fledgling forester in Montana and then as a forest scientist in California and Oregon. He also had assignments that took him to forests in Asia, Europe, and New Zealand. He and his wife, Connie, have been members and volunteers of the Sitka Center for the past 20 years. He'll be returning to teach the popular Sitka workshop this summer, Trees of Cascade Head. The forests in and around Cascade Head are part of the most extensive area of temperate rainforests in the world. The Pacific temperate rainforests stretch from Kodiak Island in southern Alaska through the coastal redwood forests of Northern California. Temperate rainforests are generally considered to be forest areas with average rainfall of more than 80 inches per year and experience only limited snowfall. Cascade Head qualifies in terms of both criteria. Forests are complex ecosystems that are much more than a collection of trees. By definition alone, however, you cannot have a forest without trees. Although our local forests do not have a great variety of tree species, their productivity (i.e., growth rates) is some of the highest ever measured anywhere on the planet. 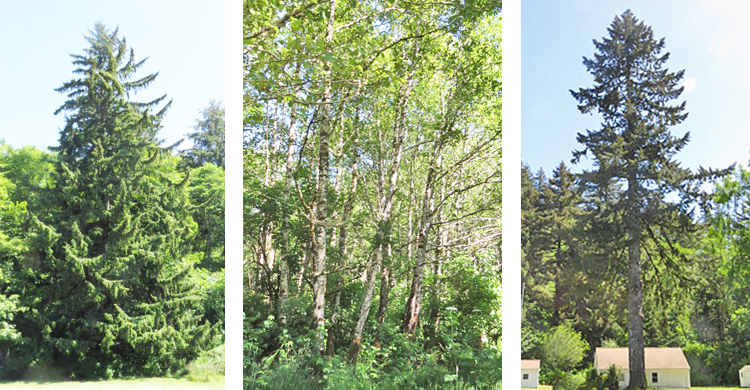 Several of the species growing in and around Cascade Head are among the largest, tallest tree species in the world. This is probably not immediately obvious because catastrophic wildfires in the mid-1800's, extensive logging, and human development have eliminated all but a very few old-growth trees in our area. But two of the only six species living in the world today known to reach heights of more than 300 feet are found in our local forests-Sitka spruce and Douglas-fir. Back when extensive logging began in the Pacific Northwest in the late eighteen-hundreds and early nineteen-hundreds, several Douglas-firs were reportedly measured at over 400 feet tall. These were probably very accurate measurements, because they were made after the trees were flat on the ground! 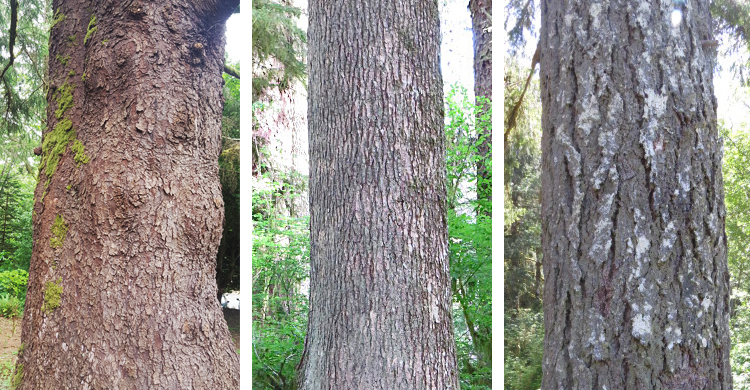 Two other species native to this area can grow to well over 200 feet tall- western hemlock and western redcedar. The only other native conifer common here is shore pine, which is a non-commercial coastal variety of lodgepole pine that grows over a large area of the inland west. There are also a few Pacific yew trees scattered in the understory of the local forests. Sitka spruce is, by far, the most common large conifer growing within a few miles of the ocean and eastward a bit further along streams and rivers. Farther inland and higher up in the Coast Range, Douglas-fir predominates. The most common broadleaved tree species in our area is red alder, a member of the birch family. It's a prominent pioneer species; i.e., one that rapidly establishes itself on forest land disturbed by fire or logging. It slowly gives way to the to the much taller and longer-lived conifers that are tolerant of becoming established and growing under the shade of the alders. The other broadleaved species in the Cascade Head area are scattered and less prominent. These include bigleaf maple, vine maple, black cottonwood, Oregon ash, and various small trees such as Oregon crabapple, black hawthorn, and bitter cherry. Because of the relatively small number of native species in our local area, learning to identify and better appreciate them is not all that difficult. So, just grab a guide book such "Trees to Know in Oregon," published by Oregon State University Extension Service, and have at it.